Many of you may have heard of the "blood group diet", a fad among celebrities, like Demi Moore, Cheryl Cole and Elizabeth Hurley. Blood group diet followers believe that different blood groups process foods differently and that eating food compatible with your blood type will make you healthier. On the other hand , eating foods that don't agree with your blood type might lead to health problems. 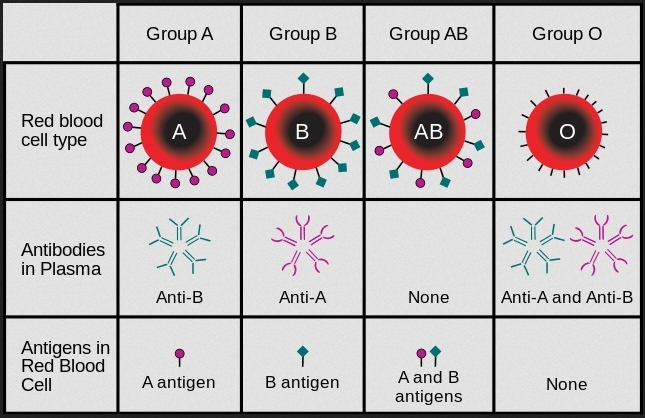 While there seems to be little scientific evidence to support this, there certainly seems to be a correlation between blood group types, your health and overall well-being. Your blood group could determine your risks of cancer, diabetes, cardiac diseases, stomach ulcers, infertility, malaria, cholera etc. Also it can predict how severely those diseases can affect you if you get them. Not just that it may also help you find out which diseases you are protected from or your least probability of contracting certain diseases. While age is still the most important risk factor when considering fertility problems, it has been found that the link between blood groups and reproductive health of women is real. For instance, a study has found that women of type A blood group seemed to be better protected against their egg counts falling over time while blood type O were up to twice as likely to have a lower egg count and poorer egg quality, which could affect the chances of conceiving. People with type O blood are at less risk of dying from malaria than people with other blood groups. But they are more vulnerable to cholera and stomach ulcers caused by viruses and bacteria. I may have to add here that my father's blood group is type O and he frequently suffers from stomach upsets and recently had a severe stomach ulcer issue that cleared after proper medication. However all non-O types have greater risk of stomach and pancreatic cancer as compared to type O's. Type O's have least risk of heart diseases while type AB's have the highest risk. Type O's have the least risk of heart diseases. Type AB's have the highest risk of heart diseases and age-related memory loss than other blood groups. Having a non-O blood group is associated with a higher risk of heart attacks, according to research presented today at Heart Failure 2017 and the 4th World Congress on Acute Heart Failure. Also individuals with non-O type blood group have an elevated risk of having a heart attack during periods of significant air pollution, compared to those with the O blood type, according to another research. 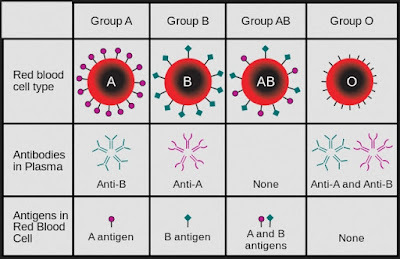 Furthermore, another study has found that people with blood groups A, B and AB were at higher risk of type 2 diabetes than group O. To elaborate - The study done on more than 80,000 women has uncovered different risks of developing type 2 diabetes associated with different blood groups, with the biggest difference a 35 percent increased risk of type 2 diabetes found in those with group B, Rhesus factor positive blood compared with the universal donor group O, Rhesus factor negative. Apparently, type O's are more affected by stress. High levels of the stress hormone cortisol has been linked to to everything from rapid aging to junk food cravings. A study from the U.S. Department of Veterans Affairs indicates that O's cortisol levels may remain elevated longer than other blood types following a stressful event. Type AB's at high risk of dementia. People with blood type AB may be more likely to develop memory loss in later years than people with other blood types, as per a study. The study found that people with AB blood were 82 percent more likely to develop the thinking and memory problems that can lead to dementia than people with other blood types. Type O associated with high death rates in case of blood loss due to trauma. According to a study that involved 901 Japanese emergency care patients, blood type O is associated with high death rates in severe trauma patients. Loss of blood is the leading cause of death in patients with severe trauma. Patients with blood type O have been shown to have lower levels of von Willebrand factor, a blood clotting agent, than those with other blood types. Lower levels of von Willebrand factor may be linked to higher levels of haemorrhage. The authors of the study suggest that a lower level of the factor is a possible explanation for the higher death rate in trauma patients with blood type O. Type A most affected by food-poisoning and traveler's diarrhea. Due to consumption of unclean, unhygienic food while traveling or in some other circumstances, people usually get affected by food-poisoning and traveler's diarrhea. Mostly E-coli bacteria is responsible for this condition. However, researchers have found that the severity of their symptoms seemed to depend on their blood type. People with type A blood were more likely to develop severe diarrhea when infected with this specific type of E. coli than those with type O or B blood, the study authors reported. They found that E. coli releases a protein that sticks to intestinal cells in people with type A blood, but not those with type O or B blood. The protein also sticks to the E. coli, making it easier for the bacteria to infect healthy cells. It's a fact that our blood groups do have an effect on our health and our immune response to diseases but it's not clear to what extent. So the best thing to do is to follow a healthy lifestyle. Eat right, exercise, meditate and worry less. And most important - do not obsess over something (like blood-groups), over which you have no control. the risk of developing gastric cancer was much higher for people with blood group A than for those with blood group O. But people with group O had a greater risk of peptic ulcers. I too beⅼieve thence, perfectly pent post!